Your old fishing boat fits all your criteria for the best possible adventures in angling. But going into the new year, you may find added technology and amenities could make things even better. If you are looking for the latest improvements in 2019, Ranger Boats has new features built specifically for bass and multi-species anglers. The RT Aluminum Series will have a fully enclosed console that can fit up to a 12-inch graph, has fresh new hullside graphics and chrome details. The interior has matching side-bolster seating with more leg room under the console. It continues to have an all-welded metal design completely free of wood. The foam-filled hulls keep the boat upright and level while reducing hull slap and providing a more comfortable ride. The RT198P model also sports an enlarged rear storage box and an Aqualon custom boat cover. It has the option to mount twin Power Pole anchors for better versatility to quietly sit in shallow water. If a 2019 fiberglass fishing boat is what you are looking for, the RT178 has a 17-foot, 8-inch Bass configuration, The RT178C is best for crappie and multispecies angling and offers multiple seat locations and livewells. The RT188 is an 18-foot, 8-inch Bass design able to handle 115 horsepower. It is also available in a crappie model. 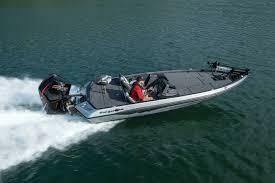 The flagship RT198P offers a 19-foot, 4-inch platform rated for 150 horsepower and increased durability you might expect from a mod-V aluminum boat. When it comes to fishing in 2019, you have excellent choices. By visiting local boat shows this winter, you will be prepared by spring. Talk to local dealers, compare popular boat brands and new trends.